Blazing with bluebells in spring, full of fungi and wild flowers, peaceful in a special way, this short walk takes you along open countryside to an ancient woodland that’s rather unique. Finish by ambling through one of the finest and most colourful mediaeval ridge and furrow meadows in England to an excellent 17th century village pub. You’ll spot cowslips, green winged orchids, greater stitchwort and saw-wort. Look for tawny owls, three types of woodpeckers, turtle doves, grass snakes and roe deer. A great walk for children, there’s even a much shorter route. Includes fun playground and large children-friendly garden at the pub. And just the best spot for a picnic. Good points of this 3.5 miles (7,700 steps) walk are the huge variety of wild flowers, fungi and wildlife throughout the year. 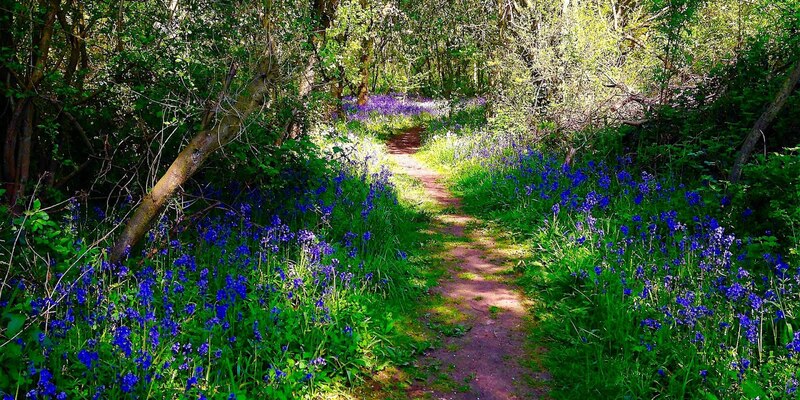 Visit in April or early May for one of the best bluebell woods. Easy walking through open countryside, woodland paths and meadows. Excellent village pub to finish, or take a picnic. 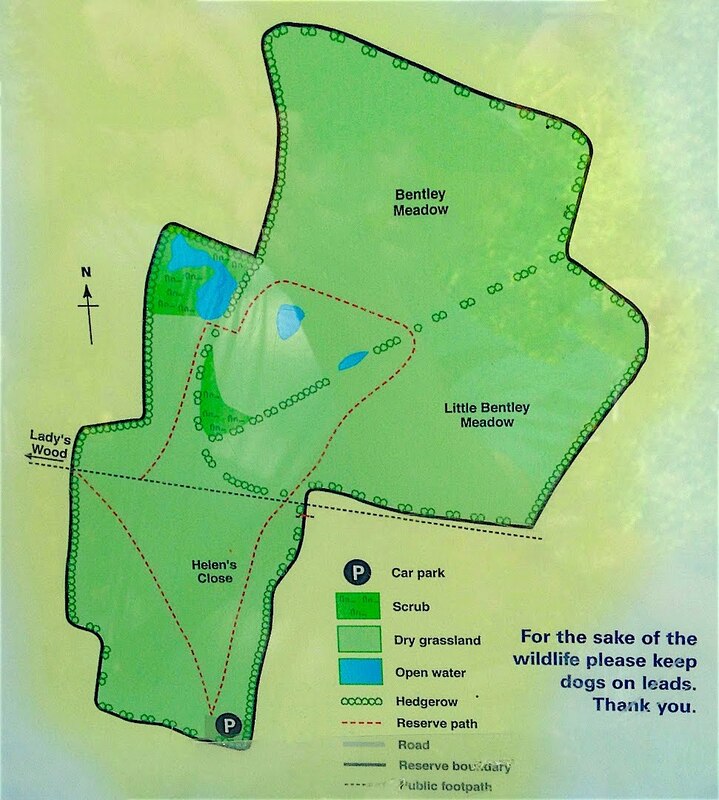 There is a car park just 700 yards from the wood, a better option if you have small children. If you'd prefer that route, to view the map click here. Park in Upwood High Street, opposite The Cross Keys. Walk up the High Street. If the ground is going to be reasonably dry, after almost 150 yards turn up the footpath on your left. Keep an eye out you don't miss it. Although signposted it's not very visible since the path squeezes along the side and back of a garden, turning right and then left. The footpath skirts field edges for 200 yards before heading diagonally across a field. Look towards the south-west and you can see Lady's Wood. At the end of the field you come to Turf Fen Road. Although termed a road, it's more a rough agricultural track, so no traffic to worry about. Turn left. If the ground is likely to be muddy don't follow the footpath sign, but walk to the top of the High Street, turn left into Longholme Road, then left again after 500 yards into Turf Fen Road. This avoids walking across the field. 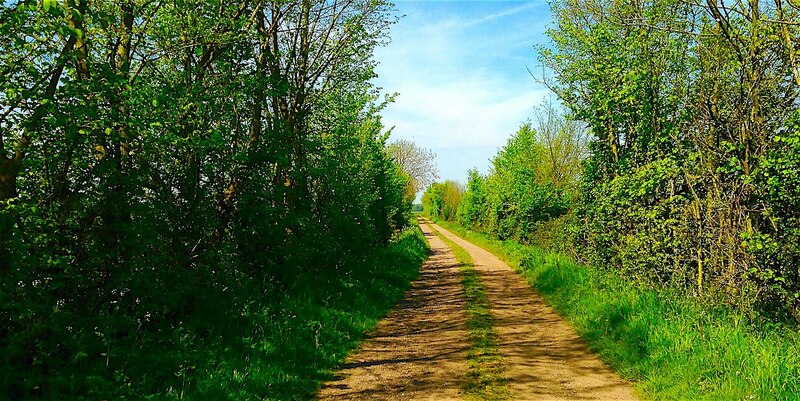 Follow Turf Fen Road, as shown in the image below a lovely walk in summer. The roadsides are lined by oak and lime trees, full of wild flowers, the air buzzing with damselflies, dragonflies and butterflies. Keep an eye out for bee flies, sipping nectar from low growing flowers. The raised land just over a mile away at the end of the road is Woodwalton Fen, a fascinating place to visit. One of only four remaining fragments of ancient fen, all of the surrounding land was at the same height before draining shrunk it to the current level. After just over half a mile, as you've almost passed Lady's Wood visible on your left, you reach a red and white gas pipe marker. Take the route to the left. Follow this path as it bends to the right, then to the left. Pass by a small shrubby area with trees on the right. As you've again almost passed Lady's Wood on your left, turn around a clump of trees on your left. Keeping the draining ditch on your left, walk up the path heading towards another gas pipe marker, this time all white, towards Lady's Wood Note this footpath isn't marked on some maps. Veer right at the top to find the entrance to the wood. One of the few remaining ancient woodlands in the area, Lady's Wood was originally managed as a traditional coppiced wood. Many of the trees were felled in 1951. Some were left lying, and the wood has now recovered and is a wonderful habitat for insects and fungi, with many varieties of wild flowers only found in an ancient woodland. 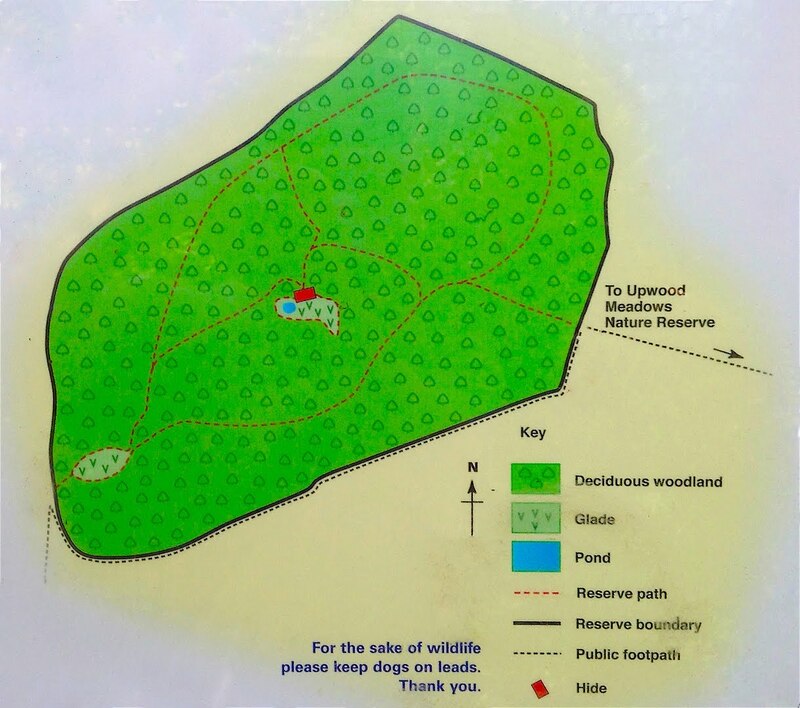 Once in the wood you can take the first path to the right, the shortest route, the second to the right, which goes past the observation hut (unfortunately out of use) and wildlife pond, or continue on for the longest path around the perimeter. The choices are between 400 to 600 yards long, so why not meander through the wood and try all three? To view a map of the wood click here. In spring the wood is awash with the blue and white of bluebells and greater stitchwort. Look out for lesser celandine and dog's mercury. You could easily walk through Lady's Wood without any indication of the richness of fungi present. On the floor and tree trunks (particularly fallen ones) at least 25 varieties of mushrooms and toadstools have been identified. Best not to touch unless you know what you're doing, since many are highly poisonous. 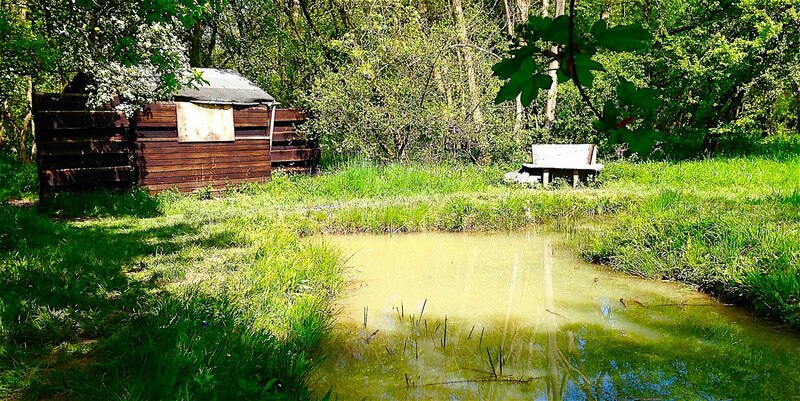 When passing the observation hut, walk around it to spend a few minutes observing the wildlife pond shown below. Full of water boatmen, pond skaters and water beetles, in spring be patient and you'll see a great crested newt (a protected species) surfacing for air. On a windy day the bench is a real oasis of calm and the perfect sun trap. Passing butterflies, dragonflies and bee flies make it one of the best spots for a picnic. If you've got time, slow down, listen and observe. Throughout the wood you'll hear birdsong. On a quiet day you could believe you've stepped back in time. Look out for roe deer, or a red kite hovering high above the tree tops. Look up into the tree canopy and there may be a tawny owl staring down at you. 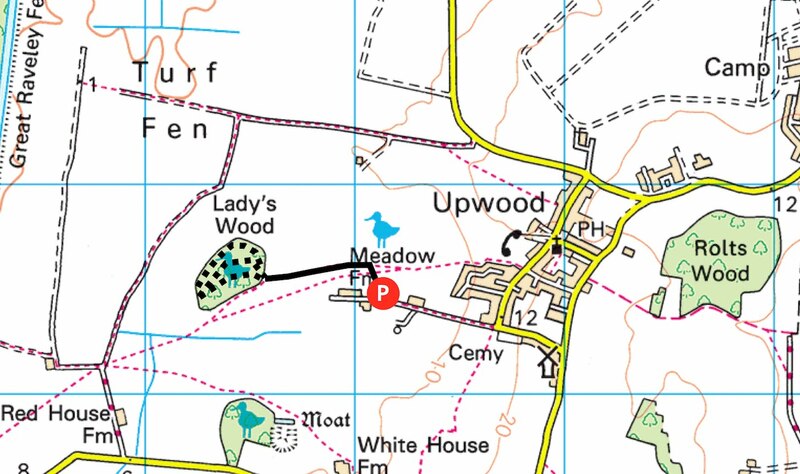 On exiting the wood, walk along field edges for 500 yards until you pass through a hedge into Upwood Meadows. The meadows consist of three fields, the one you are currently in and two similar sized fields to the left. Veer left to walk through all three. To view a map of the meadows click here. The most stunning is Bentley Meadow, considered by the Wildlife Trust one of the finest and most colourful mediaeval ridge and furrow meadows in England. These are ancient grazing meadows, with many yellow meadow ant hills. 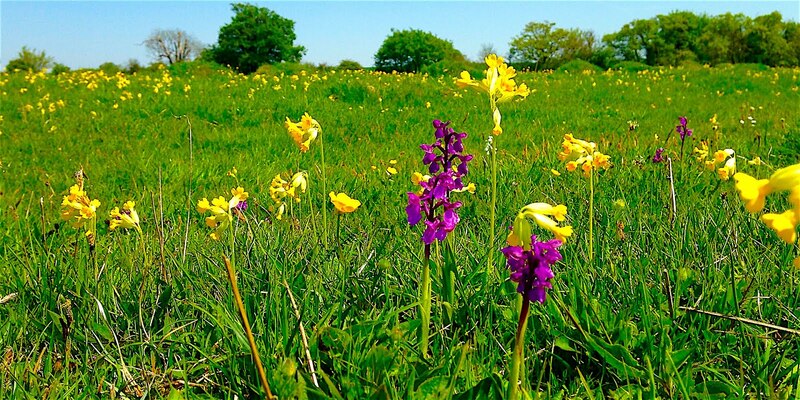 You'll find cowslips and green winged orchids as shown below. Look out for saw-wort, dropwort, sulphur clover and Dyer's greenweed. The surrounding hedges are home to turtle doves, blackcap and whitethroat. In winter migrant redwings and fieldfare feed on berries. Dew ponds are home to great crested newts. The whole area is full of damselflies, dragonflies and butterflies. On a warm day you may find a grass snake stretched across the path sunning itself. To continue, exit the first meadow field through a hedge. Follow the path skirting along the top edge of the next field and across the middle of a final field. At the far end of the field the route heads up between two houses, almost as if you're walking on the garden. You come out onto Bentley Close. Turn left and follow the road around first to the left and then right. After just over 200 yards take the path past the end of Bentley Close. Here you'll find an attractive children's playground. 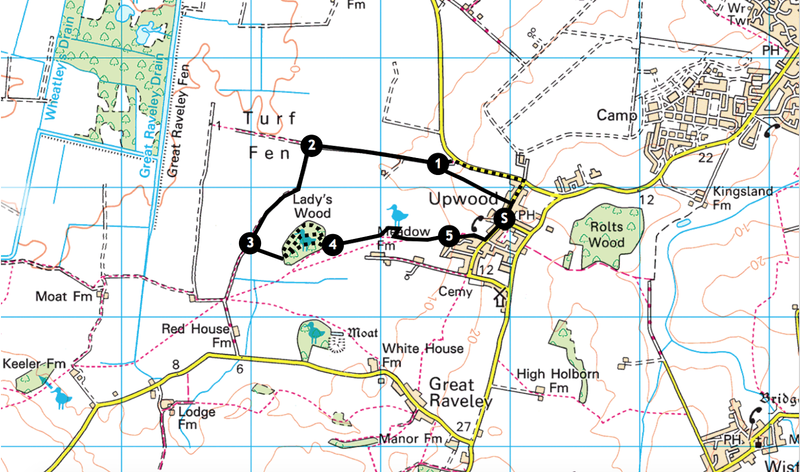 Follow the path to find yourself back on Upwood High Street. Turn left and after 300 yards you'll be back at the starting point. You'll pass St Peters Church, well worth a visit. Keys can be obtained from a nearby house, as explained on the notice board. It has many Norman features dating from the 12th century. Note how much higher the surrounding grounds are than the church foundations, a legacy of centuries of graves being dug. The Cross Keys is a 17th century pub with a good value menu. To sit at one of the tables at the front watching village life pass by is a real stress buster. There's a good, children-friendly pub garden at the back. It gets an excellent rating on Trip Advisor. Do check opening times. Currently food is served Wednesday to Saturday, Sunday lunchtime and Bank Holiday Mondays. Additionally open for drink Tuesday evenings. This was a nice walk in some remote feeling countryside. However, the pub had closed down and the part cutting across a field not marked in any way. Hi Tracey... Thanks for the feedback. I understand the Cross Keys has only just closed following the departure of the landlord. Hope it reopens soon, since it gets great reviews. Brave you taking the route across the field at the beginning of the walk. Must have been pretty muddy. At this time of year the alternative route offered is a better option. In summer the path across the field is easily found, marked through whatever crops are growing. Hope you try the walk again next year in warmer weather. It's an annual late April or early May pilgramage because of the stunning display of bluebells.